Cheese and potato pie – a really simple recipe with shortcuts! 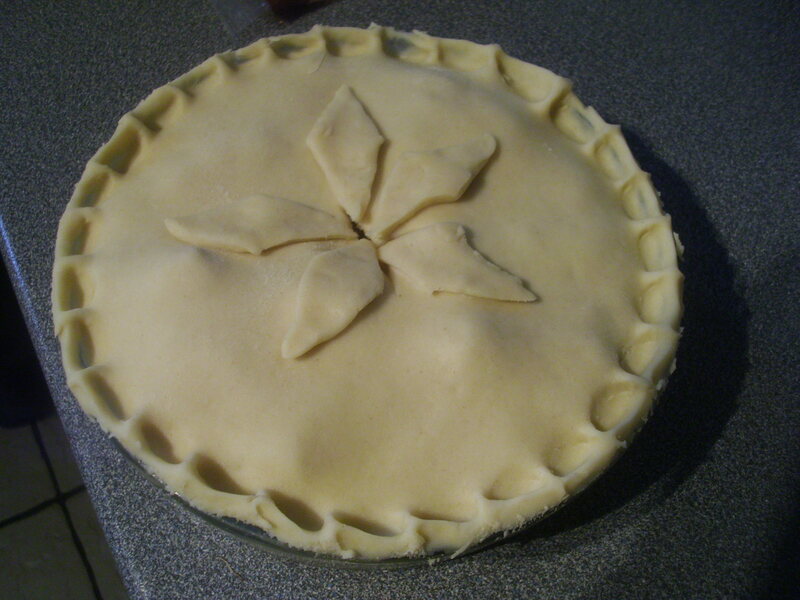 Before we start, the picture is of the pie before it was cooked. It was so delicious we had eaten it before I remembered to take one of the finished product! When I started writing this blog my intention was to help all those who wanted to cook but needed help. I had been one of those people myself when I first married, even though I had years of cooking with my Grandma to help me. Confidence in cooking is so important. Without it the opportunity to experience happy moments of sharing good food with friends are missed and, of course, so is the ability to prepare healthy food from scratch for yourself and your family. I was reminded of this fact recently when my daughter-in-law asked for advice on cooking. With that in mind I am sharing this very simple, yet delicious pie recipe. I think it was perhaps one of the first things I cooked for myself when I was a student. I can remember sharing it with some of the girls, served with a very simple salad. A great meal and a great memory. I have used bought prepared shortcrust pastry for the recipe. Trust me, there is no shame in that and, nowadays, it is so good I am sure you could pass it off as your own. Oh dear, I can almost hear members of the WI screaming in horror! In the past I have always used bought puff pastry as this is more complicated to make at home, but would never entertain the idea of buying shortcrust as it is quite easy to make. I think my snobbery has wasted a lot of time and, although I still make my own on occasion, when time is short and you need to knock up a meal in a hurry, bought is perfect. Nowadays you can buy a whole range of ready-made pastry from most large supermarkets. Well, here is the recipe. Eat it hot or cold, perfect for picnics or a buffet. Take the pastry out of the fridge before you start to prepare the filling. It will give it time to soften and will roll out without cracking or breaking up. Put the potatoes and onion in a pan of boiling salted water. Bring back to the boil then simmer over a low heat for 5 minutes until just tender. Do not allow the potatoes to boil rapidly as they will break up. Drain and leave to cool. While the potatoes are cooling, cut the pack of pastry in half and need each half gently and quickly into a ball shape. Flour the work surface and rolling-pin lightly then roll one ball of the pastry out into a circular shape. You can do this by turning the pastry round in a clockwise motion in-between rolls, it will help with the circular shape. When the pastry is about as thin as a pound coin lift gently using the rolling-pin and line your pie dish, making sure it fits snug into the corners and leaving excess hanging over the edge. Add the cheese to the potatoes and mix gently so as not to break up the potatoes. Make sure the mix is completely cold and fill the lined pie dish. Roll out the second ball of pastry as before. Dampen the edge of the pastry lining then lower your second circle of pastry on top. Pinch the edges together to make a good seal the, using a sharp knife, run it around the edge of the pie dish to remove all excess. Make a cross in the middle of the pie to allow the steam to escape. Decorate if you want with diamond-shaped pieces of pastry. Put in the fridge to allow the pastry to recover while the oven heats up. Preheat the oven to 190C/fan180C/gas 5. Brush the top of the pastry with the beaten egg then bake for 30 – 40 minutes or until the pastry is golden and firm. ← Individual Beef Wellingtons – delicious!